Your cocktail umbrella color & design experts. It comes as no surprise that color schemes play a very important role in planning events of any magnitude. For all events, including your wedding or a company function, the visual vibrancy is certainly enhanced by the event’s color coordination. Bring the room’s magic together even more with the addition of our beautiful cocktail umbrellas! Whether you’re looking to match your event’s colors with our regular inventory cocktail umbrellas – available in TRUE solids (ie. no embedded floral patterns), stripes & designs – or are planning to design your own CUSTOM cocktail umbrellas, where the design possibilities are virtually endless, our expert team will be happy to assist. We promise to make this a hassle-free experience for you, by providing ongoing communication to you every step of the way. 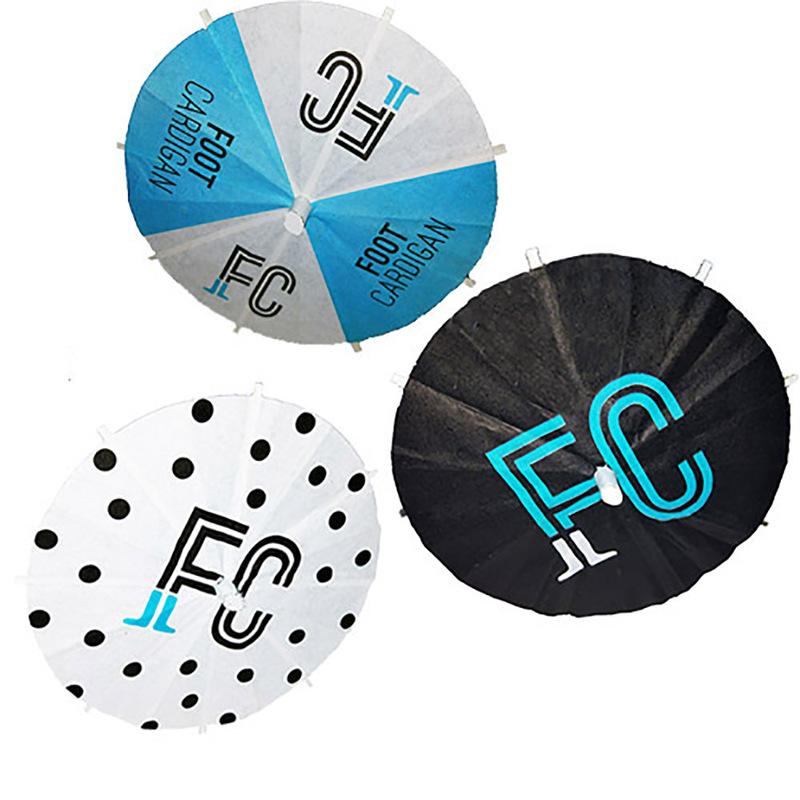 You’ll know exactly what stage your CUSTOM cocktail umbrellas are at, so there won’t be any undue stress wondering how they are progressing. 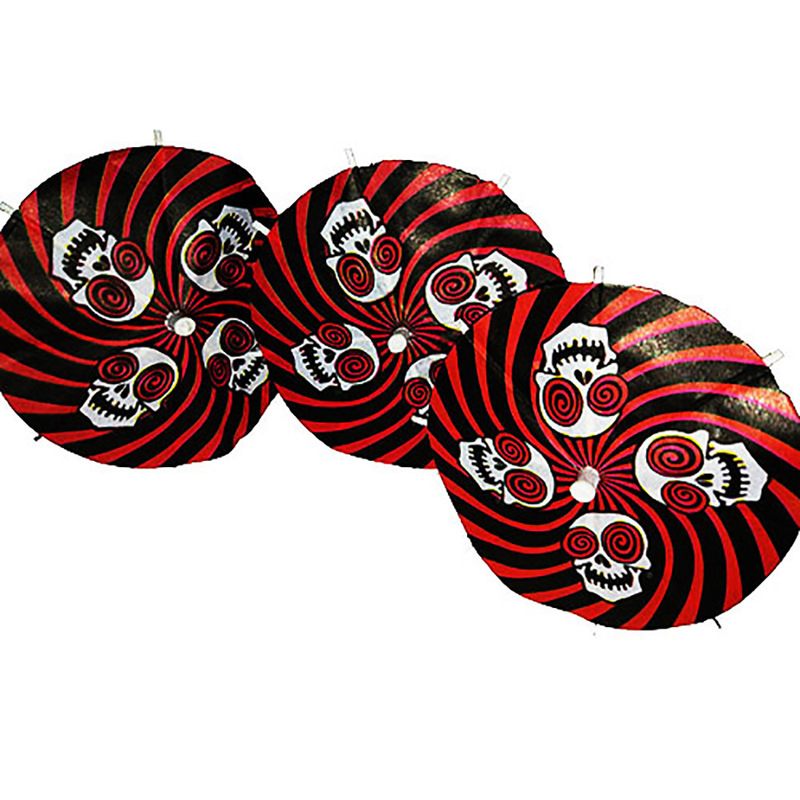 Your CUSTOM imprinted cocktail umbrellas are our business! 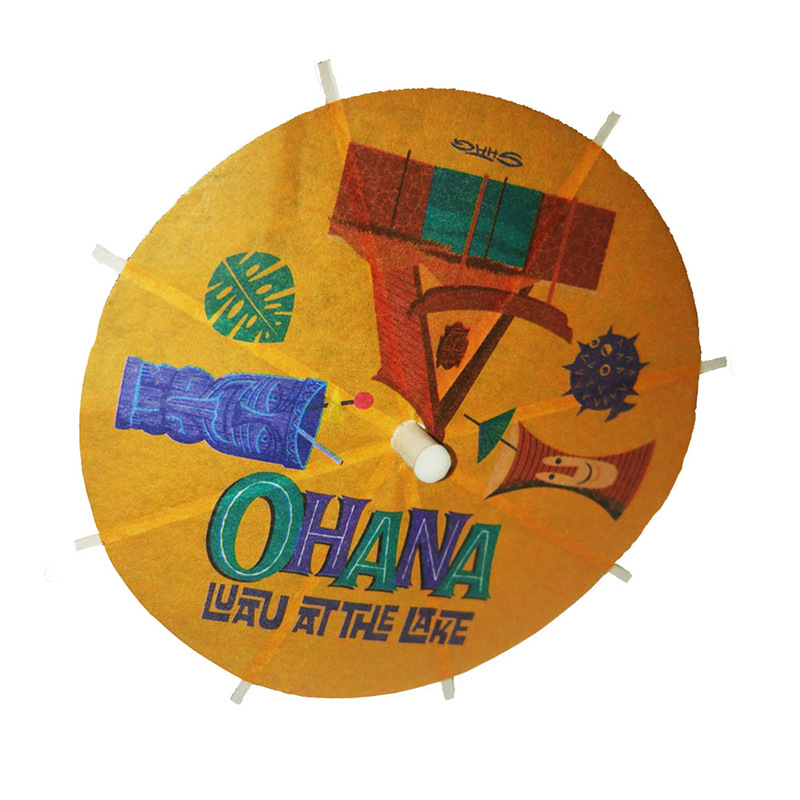 Whether you’re looking to showcase your company logo, commemorate a special moment, or simply to add more sparkle to your event, CUSTOM cocktail umbrellas’ creativity has no boundaries. Our design team will work step-by-step with you to ensure your personalized cocktail umbrellas maximize your desired presentation to perfection! Various edge options also available! to match your event’s theme! Are you looking for one or several specific individual color(s) for your cocktail umbrellas? Are you wanting to find solid colors with no floral pattern imprinted? Great! Well, instead of buying countless packages of assorted color cocktail umbrellas, and having to sift through all the colors HOPING you’ll find enough of the color you want, why not save yourself the hassle, and buy only the color(s) you need. 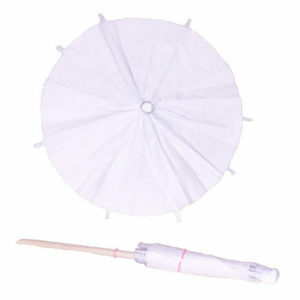 We offer several different quantity choices of each color, so you can order just what you need and avoid all the waste. 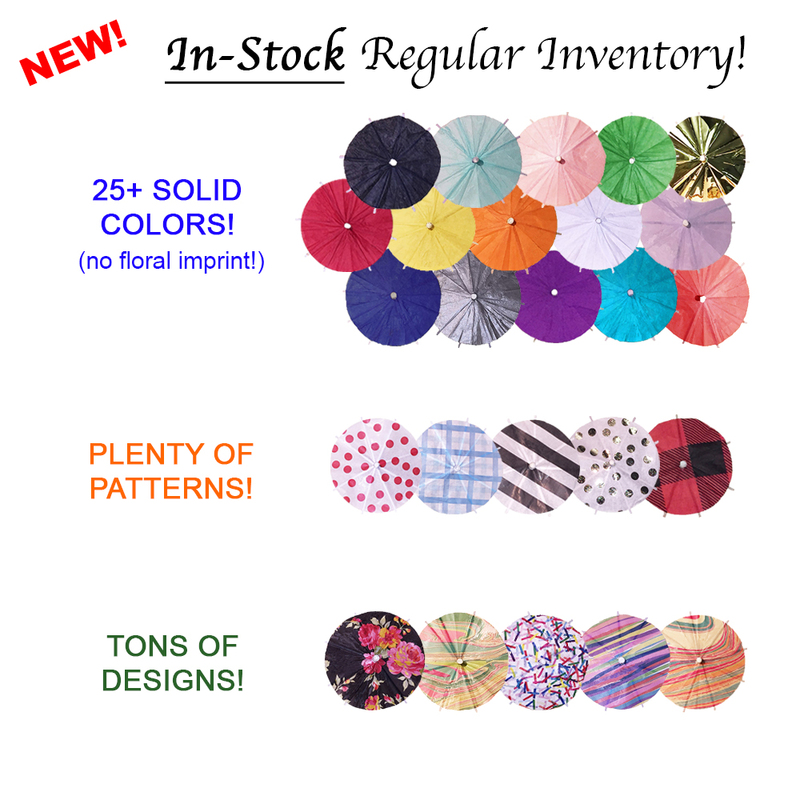 Click HERE to see our regular inventory of cocktail umbrellas – solids, stripes, patterns & designs. Our black cocktail umbrellas are TRUE SOLID BLACK drink umbrellas, with NO FLORAL IMPRINT added! Enhance your event’s presentation with these beautiful black cocktail umbrellas, the perfect complement to any gathering. Choose from various quantities of our black umbrellas for drinks, in stock now! 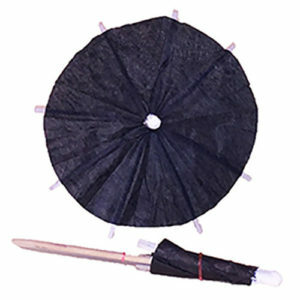 High quality black cocktail umbrellas for drinks. Our White cocktail umbrellas are TRUE SOLID WHITE drink umbrellas, with NO FLORAL IMPRINT added! These White little drink umbrellas are the perfect complement to any gathering. Make your event shine with our White tiny umbrellas for drinks, in stock now! Choose from various quantities! High quality white cocktail umbrellas for drinks. Our Cream cocktail umbrellas are TRUE SOLID CREAM drink umbrellas, with NO FLORAL IMPRINT added! These Cream little drink umbrellas are the perfect complement to any gathering. Make your event shine with our Cream tiny umbrellas for drinks, in stock now! Choose from various quantities! 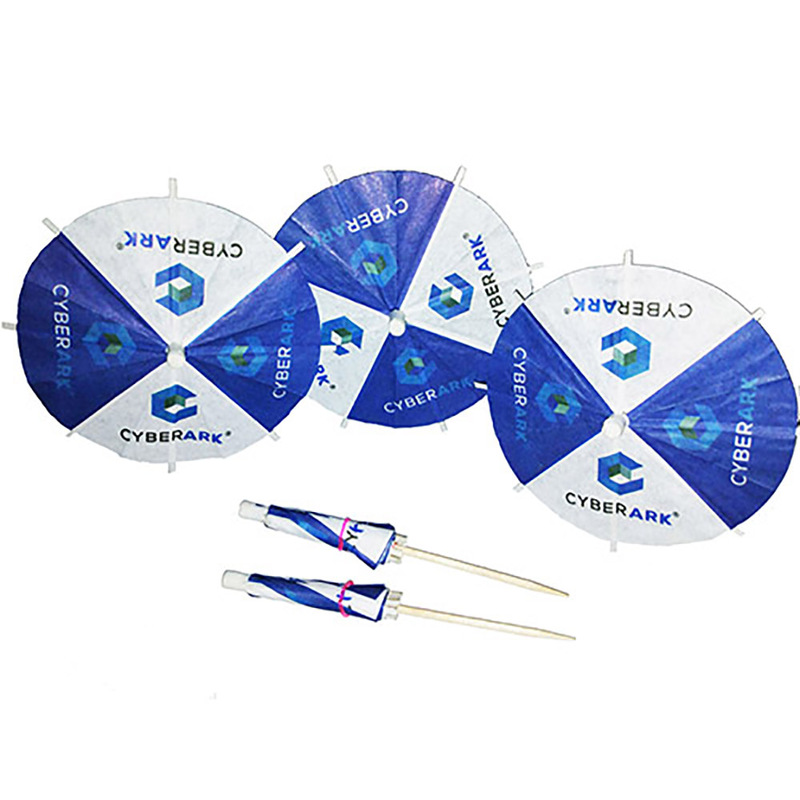 High quality cream cocktail umbrellas for drinks. Our Red cocktail umbrellas are TRUE SOLID RED drink umbrellas, with NO FLORAL IMPRINT added! These Red little drink umbrellas are the perfect complement to any gathering. Make your event shine with our Red tiny umbrellas for drinks, in stock now! Choose from various quantities! 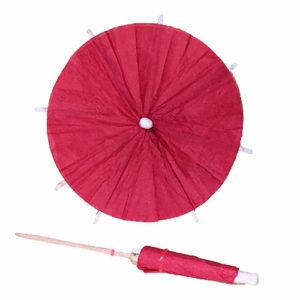 High quality red cocktail umbrellas for drinks. 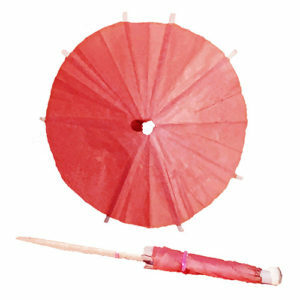 Our Fireworks Pink cocktail umbrellas are TRUE SOLID PINK drink umbrellas, with NO FLORAL IMPRINT added! These Fireworks Pink little drink umbrellas are the perfect complement to any gathering. Make your event shine with our Fireworks Pink tiny umbrellas for drinks, in stock now! Choose from various quantities! High quality pink cocktail umbrellas for drinks. Our Blushing Pink cocktail umbrellas are TRUE SOLID PINK drink umbrellas, with NO FLORAL IMPRINT added! These Blushing Pink little drink umbrellas are the perfect complement to any gathering. Make your event shine with our Blushing Pink tiny umbrellas for drinks, in stock now! Choose from various quantities! High quality Blushing Pink cocktail umbrellas for drinks. Our Neon Pink cocktail umbrellas are TRUE SOLID PINK drink umbrellas, with NO FLORAL IMPRINT added! These Neon Pink little drink umbrellas are the perfect complement to any gathering. Make your event shine with our Neon Pink tiny umbrellas for drinks, in stock now! Choose from various quantities! High quality Neon Pink cocktail umbrellas for drinks. Our Fuchsia Pink cocktail umbrellas are TRUE SOLID PINK drink umbrellas, with NO FLORAL IMPRINT added! These Fuchsia Pink little drink umbrellas are the perfect complement to any gathering. 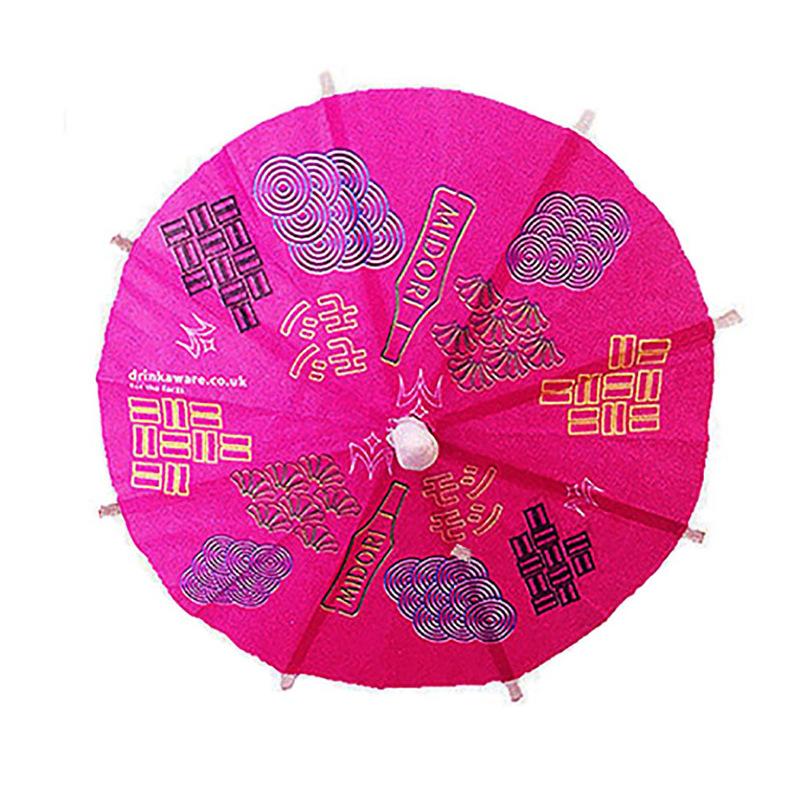 Make your event shine with our Fuchsia Pink tiny umbrellas for drinks, in stock now! Choose from various quantities! Our Light Pink cocktail umbrellas are TRUE SOLID PINK drink umbrellas, with NO FLORAL IMPRINT added! These Light Pink little drink umbrellas are the perfect complement to any gathering. 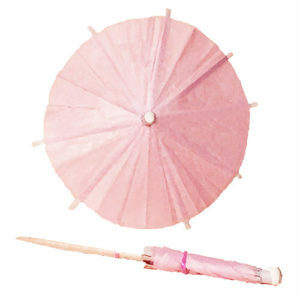 Make your event shine with our Light Pink tiny umbrellas for drinks, in stock now! Choose from various quantities! Our Dark Purple cocktail umbrellas are TRUE SOLID PURPLE drink umbrellas, with NO FLORAL IMPRINT added! These Dark Purple little drink umbrellas are the perfect complement to any gathering. Make your event shine with our Dark Purple tiny umbrellas for drinks, in stock now! Choose from various quantities! High quality purple cocktail umbrellas for drinks. Our Lilac Purple cocktail umbrellas are TRUE SOLID PURPLE drink umbrellas, with NO FLORAL IMPRINT added! 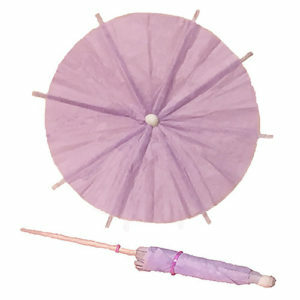 These Lilac Purple little drink umbrellas are the perfect complement to any gathering. Make your event shine with our Lilac Purple tiny umbrellas for drinks, in stock now! Choose from various quantities! Our Violet Purple cocktail umbrellas are TRUE SOLID PURPLE drink umbrellas, with NO FLORAL IMPRINT added! These Violet Purple little drink umbrellas are the perfect complement to any gathering. Make your event shine with our Violet Purple tiny umbrellas for drinks, in stock now! Choose from various quantities! Our Lavender Purple cocktail umbrellas are TRUE SOLID PURPLE drink umbrellas, with NO FLORAL IMPRINT added! These Lavender Purple little drink umbrellas are the perfect complement to any gathering. Make your event shine with our Lavender Purple tiny umbrellas for drinks, in stock now! Choose from various quantities! Our Navy Blue cocktail umbrellas are TRUE SOLID BLUE drink umbrellas, with NO FLORAL IMPRINT added! These Navy Blue little drink umbrellas are the perfect complement to any gathering. Make your event shine with our Navy Blue tiny umbrellas for drinks, in stock now! Choose from various quantities! High quality blue cocktail umbrellas for drinks. Our Royal Blue cocktail umbrellas are TRUE SOLID BLUE drink umbrellas, with NO FLORAL IMPRINT added! These Royal Blue little drink umbrellas are the perfect complement to any gathering. Make your event shine with our Royal Blue tiny umbrellas for drinks, in stock now! Choose from various quantities! Our Sky Blue cocktail umbrellas are TRUE SOLID BLUE drink umbrellas, with NO FLORAL IMPRINT added! These Sky Blue little drink umbrellas are the perfect complement to any gathering. Make your event shine with our Sky Blue tiny umbrellas for drinks, in stock now! Choose from various quantities! Our Aqua cocktail umbrellas are TRUE SOLID AQUA drink umbrellas, with NO FLORAL IMPRINT added! These Aqua little drink umbrellas are the perfect complement to any gathering. 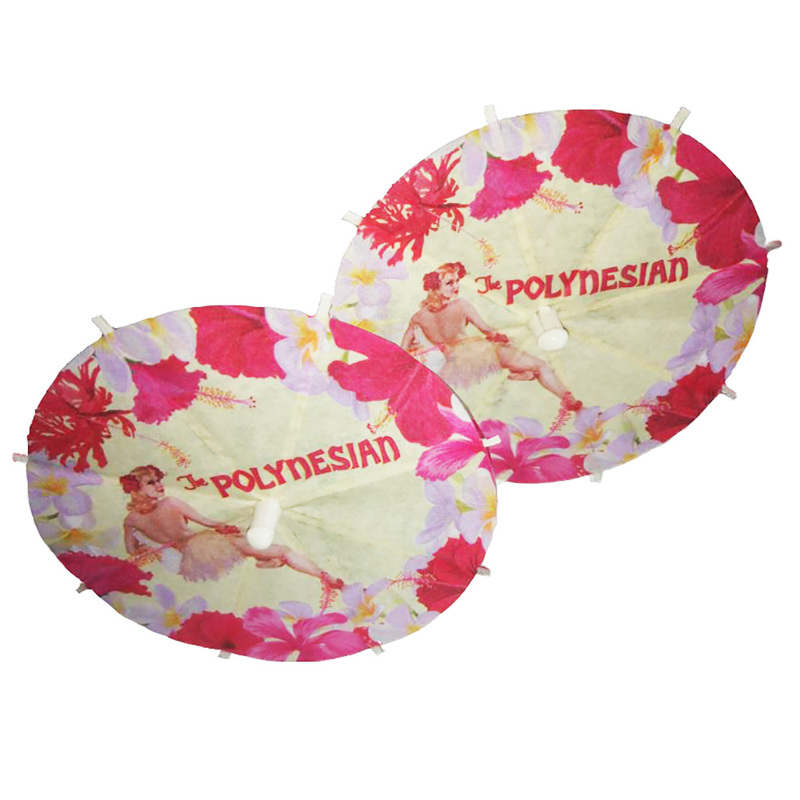 Make your event shine with our Aqua tiny umbrellas for drinks, in stock now! Choose from various quantities! 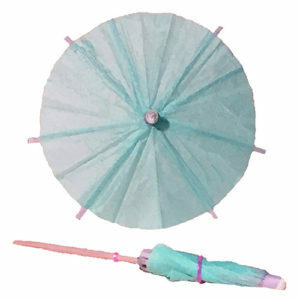 High quality aqua / turquoise cocktail umbrellas for drinks. Our Light Blue cocktail umbrellas are TRUE SOLID BLUE drink umbrellas, with NO FLORAL IMPRINT added! These Light Blue little drink umbrellas are the perfect complement to any gathering. Make your event shine with our Light Blue tiny umbrellas for drinks, in stock now! Choose from various quantities! Our Emerald Green cocktail umbrellas are TRUE SOLID GREEN drink umbrellas, with NO FLORAL IMPRINT added! 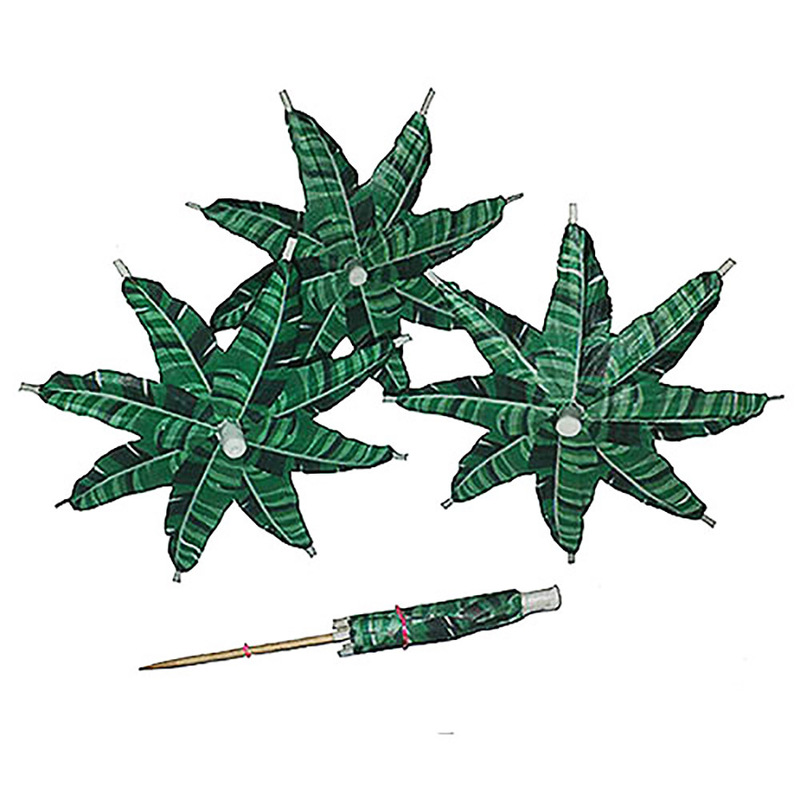 These Emerald Green little drink umbrellas are the perfect complement to any gathering. Make your event shine with our Emerald Green tiny umbrellas for drinks, in stock now! Choose from various quantities! 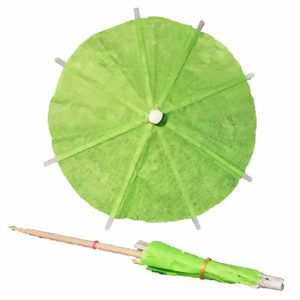 High quality green cocktail umbrellas for drinks. Our Olive Green cocktail umbrellas are TRUE SOLID GREEN drink umbrellas, with NO FLORAL IMPRINT added! These Olive Green little drink umbrellas are the perfect complement to any gathering. 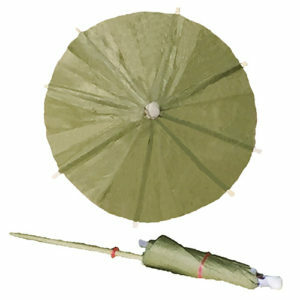 Make your event shine with our Olive Green tiny umbrellas for drinks, in stock now! Choose from various quantities! Our Lime Green cocktail umbrellas are TRUE SOLID GREEN drink umbrellas, with NO FLORAL IMPRINT added! These Lime Green little drink umbrellas are the perfect complement to any gathering. Make your event shine with our Lime Green tiny umbrellas for drinks, in stock now! Choose from various quantities! Our Papaya Orange cocktail umbrellas are TRUE SOLID ORANGE drink umbrellas, with NO FLORAL IMPRINT added! These Papaya Orange little drink umbrellas are the perfect complement to any gathering. Make your event shine with our Papaya Orange tiny umbrellas for drinks, in stock now! Choose from various quantities! 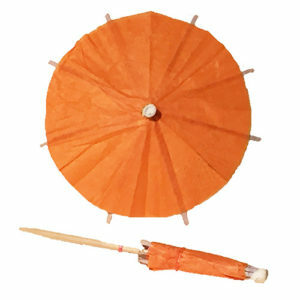 High quality orange cocktail umbrellas for drinks. Our Pumpkin Orange cocktail umbrellas are TRUE SOLID ORANGE drink umbrellas, with NO FLORAL IMPRINT added! These Pumpkin Orange little drink umbrellas are the perfect complement to any gathering. Make your event shine with our Pumpkin Orange tiny umbrellas for drinks, in stock now! Choose from various quantities! Our Canary Yellow cocktail umbrellas are TRUE SOLID YELLOW drink umbrellas, with NO FLORAL IMPRINT added! These yellow little drink umbrellas are the perfect complement to any gathering. Make your event shine with our Canary Yellow tiny umbrellas for drinks, in stock now! Choose from various quantities! 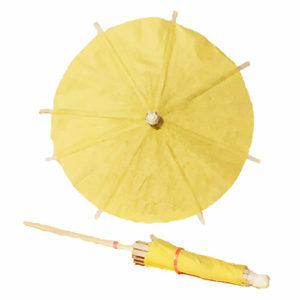 High quality yellow cocktail umbrellas for drinks. Our Neon Yellow cocktail umbrellas are TRUE SOLID YELLOW drink umbrellas, with NO FLORAL IMPRINT added! These yellow little drink umbrellas are the perfect complement to any gathering. Make your event shine with our Neon Yellow tiny umbrellas for drinks, in stock now! Choose from various quantities! Our Satin Gold cocktail umbrellas are TRUE SOLID GOLD drink umbrellas, with NO FLORAL IMPRINT added! These Satin Gold little drink umbrellas are the perfect complement to any gathering. Make your event shine with our Satin Gold tiny umbrellas for drinks, in stock now! Choose from various quantities! High quality gold cocktail umbrellas for drinks. Our Satin Silver cocktail umbrellas are TRUE SOLID SILVER drink umbrellas, with NO FLORAL IMPRINT added! These Satin Silver little drink umbrellas are the perfect complement to any gathering. Make your event shine with our Satin Silver tiny umbrellas for drinks, in stock now! Choose from various quantities! High quality silver cocktail umbrellas for drinks. These Gold Foil cocktail umbrellas, made from a shiny gold foil, are TRUE SOLID Gold Foil drink umbrellas, with NO FLORAL IMPRINT added! These Gold Foil little drink umbrellas are the perfect complement to any gathering. Make your event shine with our Gold Foil tiny umbrellas for drinks, in stock now! Choose from various quantities! These Silver Foil cocktail umbrellas, made from a shiny silver foil/mylar, are TRUE SILVER drink umbrellas, with NO FLORAL IMPRINT added! These Silver Foil little drink umbrellas are the perfect complement to any gathering. Make your event shine with our Silver Foil tiny umbrellas for drinks, in stock now! Choose from various quantities! These Red Foil cocktail umbrellas, made from a shiny red foil/mylar, are TRUE SOLID RED drink umbrellas, with NO FLORAL IMPRINT added! These Red Foil little drink umbrellas are the perfect complement to any gathering. Make your event shine with our Red Foil tiny umbrellas for drinks, in stock now! Choose from various quantities! These Green Foil cocktail umbrellas, made from a shiny Green foil/mylar, are TRUE SOLID GREEN drink umbrellas, with NO FLORAL IMPRINT added! These Green Foil little drink umbrellas are the perfect complement to any gathering. 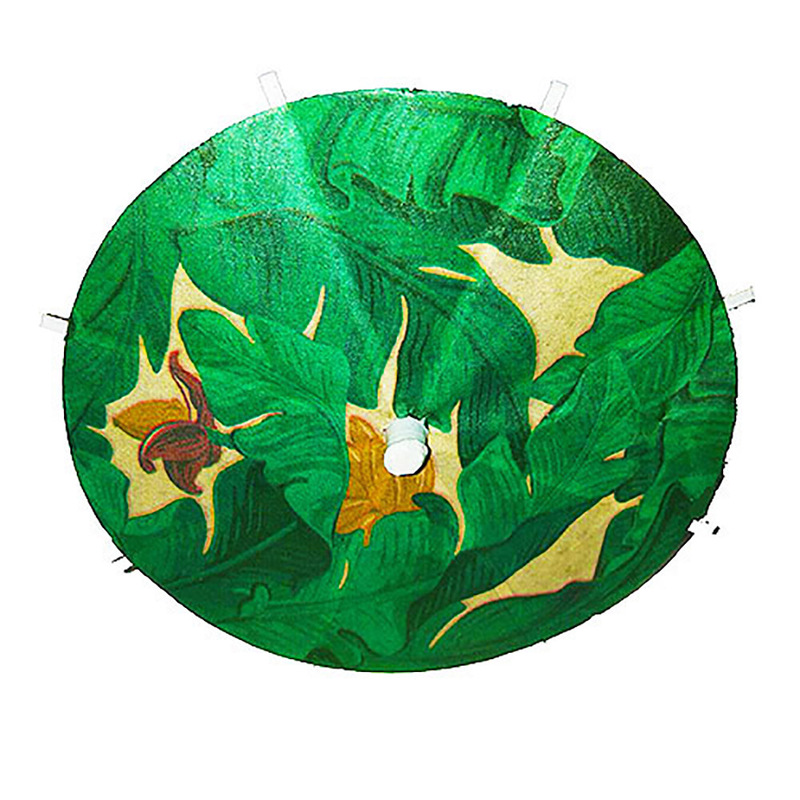 Make your event shine with our Green Foil tiny umbrellas for drinks, in stock now! Choose from various quantities! These Black & White cocktail umbrellas are designed to add class, style and color to any event, so use our drink umbrellas to “really bring the room together”! These Black & White little drink umbrellas are the perfect complement to any gathering. 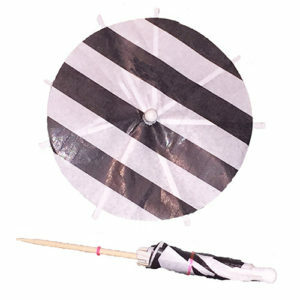 Make your event shine with our Black & White tiny umbrellas for drinks, in stock now! Choose from various quantities! High quality black & white cocktail umbrellas for drinks. These Red & White cocktail umbrellas are designed to add class, style and color to any event, so use our drink umbrellas to “really bring the room together”! These Red & White little drink umbrellas are the perfect complement to any gathering. Make your event shine with our Red & White tiny umbrellas for drinks, in stock now! Choose from various quantities! These Beige & Tan cocktail umbrellas are designed to add class, style and color to any event, so use our drink umbrellas to “really bring the room together”! 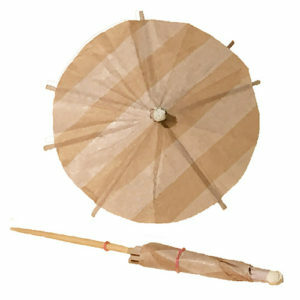 These Beige & Tan little drink umbrellas are the perfect complement to any gathering. Make your event shine with our Beige & Tan tiny umbrellas for drinks, in stock now! Choose from various quantities! High quality beige & tan cocktail umbrellas for drinks. These beige & tan Wood Grain design cocktail umbrellas are designed to add class, style and color to any event, so use our drink umbrellas to “really bring the room together”! These beige & tan Wood Grain design little drink umbrellas are the perfect complement to any gathering. Make your event shine with our Beige & tan Wood Grain design tiny umbrellas for drinks, in stock now! Choose from various quantities! High quality beige & tan Wood Grain design cocktail umbrellas for drinks. These Striped Blue cocktail umbrellas are designed to add class, style and color to any event, so use our drink umbrellas to “really bring the room together”!! These Blue Stripe little drink umbrellas are the perfect complement to any gathering. 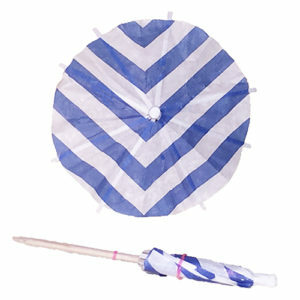 Make your event shine with our Zigzag Blue Stripe tiny umbrellas for drinks, in stock now! Choose from various quantities! High quality blue zig zag stripe cocktail umbrellas. These Party Stripe cocktail umbrellas are designed to add class, style and color to any event, so use our drink umbrellas to “really bring the room together”! These Party Stripe little drink umbrellas are the perfect complement to any gathering. Make your event shine with our Party Stripe tiny umbrellas for drinks, in stock now! Choose from various quantities! High quality stripe cocktail umbrellas for drinks. These Seaside Marble design cocktail umbrellas are designed to add class, style and color to any event, so use our drink umbrellas to “really bring the room together”! These Seaside Marble little drink umbrellas are the perfect complement to any gathering. Make your event shine with our Seaside Marble design tiny umbrellas for drinks, in stock now! Choose from various quantities! High quality marble design cocktail umbrellas for drinks. These Coral Marble cocktail umbrellas are designed to add class, style and color to any event, so use our drink umbrellas to “really bring the room together”! 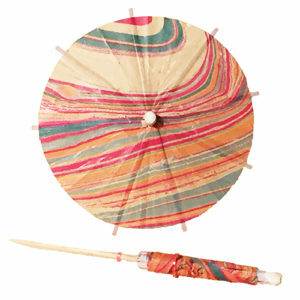 These Coral Marble little drink umbrellas are the perfect complement to any gathering. Make your event shine with our Coral Marble design tiny umbrellas for drinks, in stock now! Choose from various quantities! These Plaid cocktail umbrellas are designed to add class, style and color to any event, so use our drink umbrellas to “really bring the room together”! These Red & Black Plaid little drink umbrellas are the perfect complement to any gathering. 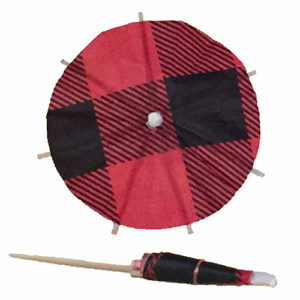 Make your event shine with our Red & Black Plaid tiny umbrellas for drinks, in stock now! Choose from various quantities! High quality red & black plaid cocktail umbrellas for drinks. These Blue Plaid cocktail umbrellas are designed to add class, style and color to any event, so use our drink umbrellas to “really bring the room together”! These Blue Plaid little drink umbrellas are the perfect complement to any gathering. 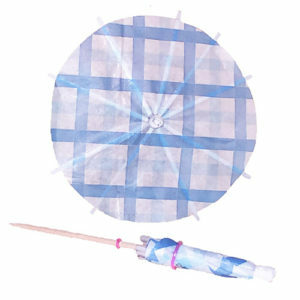 Make your event shine with our Blue Plaid tiny umbrellas for drinks, in stock now! Choose from various quantities! High quality blue plaid cocktail umbrellas for drinks. These Black Polka Dot cocktail umbrellas are designed to add class, style and color to any event, so use our drink umbrellas to “really bring the room together”! These Black Polka Dot little drink umbrellas are the perfect complement to any gathering. Make your event shine with our Black Polka Dot tiny umbrellas for drinks, in stock now! Choose from various quantities! High quality polka dot cocktail umbrellas for drinks. These Polka Dot Red cocktail umbrellas are designed to add class, style and color to any event, so use our drink umbrellas to “really bring the room together”! These Red Polka Dot little drink umbrellas are the perfect complement to any gathering. Make your event shine with our Red Polka Dot tiny umbrellas for drinks, in stock now! Choose from various quantities! These Polka Dot Blue cocktail umbrellas are designed to add class, style and color to any event, so use our drink umbrellas to “really bring the room together”! These Blue Polka Dot little drink umbrellas are the perfect complement to any gathering. 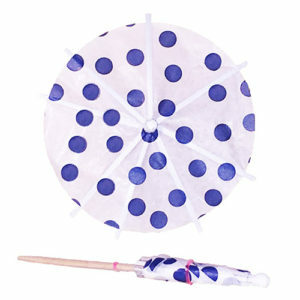 Make your event shine with our Blue Polka Dot tiny umbrellas for drinks, in stock now! Choose from various quantities! These Mini Pink Polka Dot cocktail umbrellas are designed to add class, style and color to any event, so use our drink umbrellas to “really bring the room together”! These Mini Pink Polka Dot little drink umbrellas are the perfect complement to any gathering. Make your event shine with our Mini Pink Polka Dot tiny umbrellas for drinks, in stock now! Choose from various quantities! These Black with Large Gold Polka Dots cocktail umbrellas are designed to add class, style and color to any event, so use our drink umbrellas to “really bring the room together”! These Black with Large Gold Polka Dots little drink umbrellas are the perfect complement to any gathering. Make your event shine with our Black with Large Gold Polka Dots tiny umbrellas for drinks, in stock now! Choose from various quantities! These Valentine Red Hearts cocktail umbrellas are designed to add class, style and color to any event, so use our drink umbrellas to “really bring the room together”! These Red Hearts little drink umbrellas are the perfect complement to any gathering. Make your event shine with our Red Hearts tiny umbrellas for drinks, in stock now! Choose from various quantities! 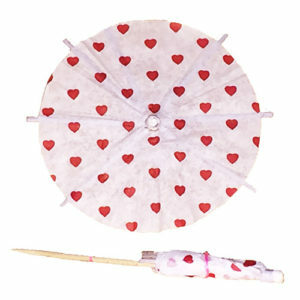 High quality Valentine's Red Hearts cocktail umbrellas for drinks. These Confetti Party cocktail umbrellas are designed to add class, style and color to any event, so use our drink umbrellas to “really bring the room together”! These Confetti Party little drink umbrellas are the perfect complement to any gathering. 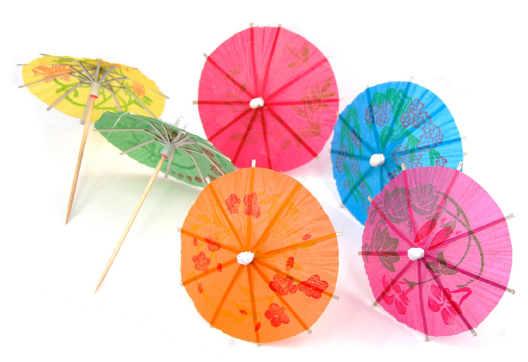 Make your event shine with our Confetti Party tiny umbrellas for drinks, in stock now! Choose from various quantities! High quality party cocktail umbrellas for drinks. These Christmas cocktail umbrellas, featuring Large Gold Trees & Sparkles, are designed to add class, style and color to any event, so use our drink umbrellas to “really bring the holidays together”! These Christmas little drink umbrellas are the perfect complement to any gathering. Make your event shine with our Christmas tiny umbrellas for drinks, in stock now! Choose from various quantities! High quality Christmas cocktail umbrellas for drinks. These Christmas Tree cocktail umbrellas, featuring Large Gold Trees & Sparkles, are designed to add class, style and color to any event, so use our drink umbrellas to “really bring the holidays together”! These Christmas little drink umbrellas are the perfect complement to any gathering. Make your event shine with our Christmas tiny umbrellas for drinks, in stock now! Choose from various quantities! These Snowflake Christmas cocktail umbrellas are designed to add class, style and color to any event, so use our drink umbrellas to “really bring the holidays together”! These Snowflake Christmas little drink umbrellas are the perfect complement to any gathering. Make your event shine with our Snowflake Christmas tiny umbrellas for drinks, in stock now! Choose from various quantities! These beautiful, premium Roses with Black cocktail umbrellas, exclusive to CocktailUmbrellas.com, are designed to add class, style and color to any event, so use our drink umbrellas to “really bring the holidays together”! These Roses with Black little drink umbrellas are the perfect complement to any gathering. Make your event shine with our Roses with Black tiny umbrellas for drinks, in stock now! Choose from various quantities! These Polka Dot Gold cocktail umbrellas are designed to add class, style and color to any event, so use our drink umbrellas to “really bring the room together”! These shiny Gold Polka Dot little drink umbrellas are the perfect complement to any gathering. Make your event shine with our shiny Gold Polka Dot tiny umbrellas for drinks, in stock now! Choose from various quantities! 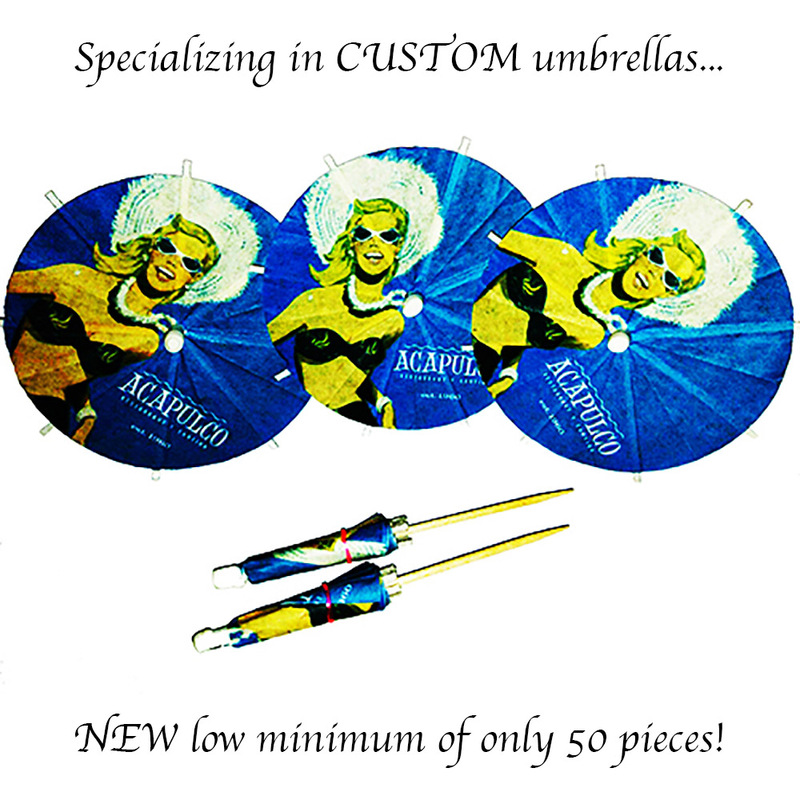 If you wish to order our cocktail drink umbrellas over the phone, please call toll-free 1-855-922-0525. Contact us with any questions you might have regarding our products.